Many a times we compare two data values of the same type. One way to do this is to find out the difference (a-b). Other method of comparison could be by division or finding out ratios. (For example, a/b also written as a: b). For example: Cost of a car is Rs. 250,000 and cost of a bike is Rs. 50,000. If we compare the two numbers using difference method, difference is Rs. 200,000. If we compare by division or ratios, they would be in the ratio: 250,000/50,000 = 5/1. Thus, we can say that cost of the car is five times the cost of the bike. Two ratios in their fraction notation can be compared just as we compare real numbers. If two ratios are equal, we say that they are in proportion and use the symbol “::” or “=” to equate the two ratios. For example: Consider two ratios, a:b and c:d. These ratios are said to be in proportion if a/b=c/d and we write a:b::c:d or a,b,c and d are in proportion. Here first and fourth terms are known as extreme terms (a and d). Second and third terms are known as middle terms (b and c). Example 1: Divide Rs. 60 in the ratio 1:2 between Mike and John. Solution: Let Mike’s part be x. Then John’s part is 2x. Example 2: If there are Rs. 495 in a bag in denominations of one-rupee, 50-paisa and 25-paisa coins which are in the ratio 1:8:16. How many 50 paisa coins are there in bag? Example 3: Three Jars contain alcohol to water in the ratios 3:5, 1:3 and 1:1. If all the three solutions are mixed, what will be the ratio of alcohol to water in final solution? Solution: Here we are not given the quantities of the solution in three jars. Only the ratio of alcohol to water is given. If the ratio of quantity of solution would have been there, we could determine the ration of alcohol to water in final solution. Hence, the answer here will be cannot be determined. Example 4: A lump of two metals weighing 18gm is worth Rs. 87. If their weights are interchanged, it would be worth Rs. 78.6. If the price of one metal is Rs. 6.7 per gram, find the weight of the other metal in the mixture. Solution: Let the weight of first metal be x. Then the weight for other metal would be (18-x). Example 5: A bottle of whisky contains ¾ of whisky and the rest is water. How much of the mixture must be taken away and substituted by equal quantity of water so as to have half whisky and half water? Solution: We will use the formula below for answering this. This is a standard formula for mixtures and very useful when questions concerning mixture and ratio comes in. X= Quantity of mixture replaced = ?? So, the answer is Quantity of mixture replaced would be 1/3 of the original mixture. Example 6: A man covered a total distance of 1,000 km in 16 hr, partly in a taxi at 36 km/hr and partly in a bus at 80 km/hr. The distance covered by the bus is approx.? Solution: This is a classic example of how ratios questions comes combined with the concept of speed, time and distance. Now let’s look at how we can solve this particular question. We know, Speed = distance / time. Similarly, time taken by the taxi to cover (1000-x) km = (1000-x)/36 hr. We know as per question that total time taken is 16 hr. Example 7: In a mixture of 35 L, the ratio of milk to water is 4:1. If 7 L water is added to the mixture, the ratio of milk to water changes to a new ratio. If we want ratio of milk and water to change back to the original value, how much milk is to be added now? Let the quantity of water be x. Then, quantity of milk would be 4x. Example 8: The ratio of a two-digit natural number to a number formed by reversing its digits is 4 : 7. Which of the following is the sum of all the numbers of all such pairs? Solution: Let the two digit number be 10a + b and the number formed by reversing its digits be 10b + a. So, let us list down all possible values for a and b. 12 + 21 + 24 + 42 + 36 + 63 + 48 + 84 = 330. Example 9: Rs.432 is divided among three workers A, B and C such that 8 times A’s share is equal to 12 times B’s share which is equal to 6 times C’s share. How much did A get? 8 coins for his share of the 8 loaves. All loaves were of the same size. The second traveller (who had 3 loaves) suggests that he will be paid 3 coins, and that the first traveller be paid 5 coins. The first traveller says that he should get more than 5 coins. How much should the first traveller get? Solution: Each traveler had 8/3 loaves after the distribution of the loaves. First traveler has given (5- 8/3) = 7/3 loaves to the third one. Second traveler had given (3- 8/3) = 1/3 loaves to the third one. Hence, first traveler should get 7 coins and second traveler should get 1 coin. 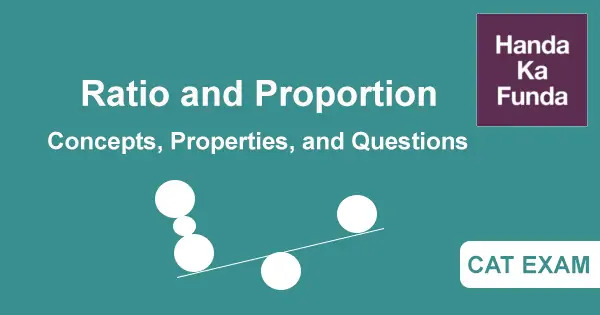 Conclusion: Ratio and proportion is a very easy topic in itself, but questions are mostly asked from ratio and proportion by combining this with various other topics. Thus, In CAT preparation, it becomes very essential that we have a familiarity of all the topics – if not at expert level in all, surely the basics.